Lee Morgan was a Jazz child prodigy and should have become of its greatest exponents. Sadly, his murder denied him his due and almost assured success in the Fusion era. His legacy of music is however undeniable. ‘The Sidewinder’ remains his most successful album commercially – a pop hit at the time and unusually used for an automobile advertisement – unheard of for a Jazz tune in the mid 60’s. ‘The Sidewinder’ is instantly recognisable with its stepping beat based on a blues. The lead line of Lee Morgan, the young gun Joe Henderson and Barry Harris subtle piano is a potent mix. Billy Higgins is magnificent on drums and supported ably by bassist Bob Cranshaw. Morgan composed all five tunes and they reflect a confidence and infectious optimism of the time. This was the dawn of a new era. ‘The Sidewinder’ is no one track wonder. The Latin tinged ‘Totem Pole’ and ‘Gary’s Notebook’, which has a deeper mood, is strong compositions. The finale ‘Hocus Pocus’ is no such thing, being a powerful yet simple blowing tune. 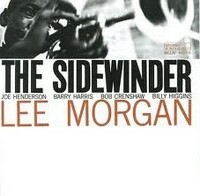 ‘The Sidewinder’ is one of Blue Note’s most influential albums as Alfred Lion tried to replicate its success with Lee and many other artist’s albums. Groovy music from the timeless era of the greatest jazz produced. > My all time time favourite era for Blue Note. The title track is a classic…Joe Henderson sounds immaculate on sax. I never stop playing this one. Used to get played a lot in Ronnie Scotts Club around the foyer area.